Hilton will be heading to this year’s Arabian Hotel International Conference (AHIC) in Ras al Khaimah with an expansion plan for the region, which the company expects will see it grow three-fold to over 120 hotels in the coming years. Having pioneered the presence of international brands in the Middle East with the opening of Hilton Abu Dhabi nearly 50 years ago, it today operates 41 properties across the region. With a focus on developing its portfolio of world-class brands through capital light organic growth, Hilton has 81 further hotels signed with local partners and investors, the majority of which are expected to open by 2023. Carlos Khneisser, vice president, Development, Middle East, North Africa & Turkey, Hilton said: “The Middle East is perfectly positioned to take advantage of the changing demographics of global travel through its geographic location and continued investment in creating aspirational destinations. Hilton is seeing strong expansion across the Middle East with hotels signed in Jordan, Lebanon, Oman, Bahrain, Kuwait, among other countries. However, the main growth engines for Hilton in the Middle East are the UAE and Saudi Arabia, which together account for approximately two-thirds of growth in the region. In the UAE, Hilton is preparing to reinvigorate its portfolio by continuing to drive growth in the focused service sector and welcoming new flagship upscale properties to the market. 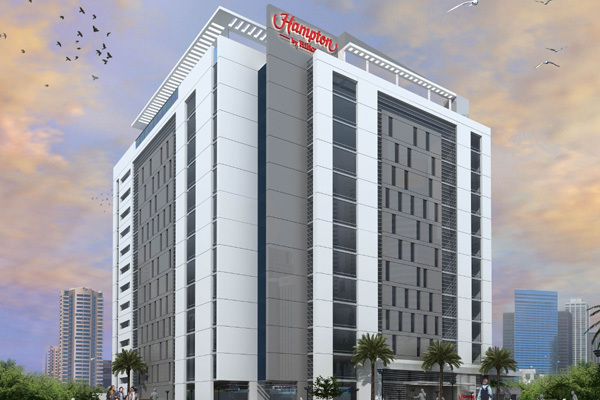 Its economy Hampton by Hilton brand launches later this year with the opening of Hampton by Hilton Dubai Airport, while Hilton Dubai Palm and Hilton Abu Dhabi Yas Island will add more than 1,200 premium upscale rooms boasting innovations such as digital key and offering the guest the ability to choose their room via the Hilton Honors app. Saudi Arabia is Hilton’s largest development market in the region and the company expects to grow from 10 to 40 properties in the country within the next five years. It looks forward to the opening of Hilton Riyadh later this year. Ahead of AHIC, it has confirmed an additional four new signings in Saudi Arabia, all of which are expected to begin welcoming guests by 2021.